Hundreds of thousands of Vietnamese live in Australia. By far the most of these Australians arrived in the 1970's as refugees, as boat people. Recently, during July 2003, a small boat called the 'Hao Kiet' arrived in Port Hedland, but as soon as the news broke publicly, the boatpeople were driven on to Christmas Island by the Howard government. Fourteen months later, and after huge expenditure to Australian taxpayers, many of them are still imprisoned there. This page features the voice of an Olympic veteral and medal winner (and to many a hero). 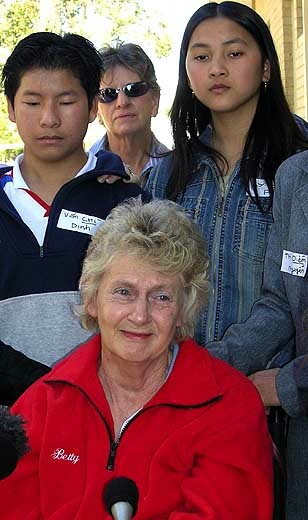 Mandurah resident Ms Betty Cuthbert started speaking out about the Hao Kiet refugees in September 2004. We also issued a statement at the time. That statement was printed in The Islander, the Christmas Island newspaper. And we're told, a lively debate raged on Christmas Island as a result of our statement having been published in the newspaper. Below is our statement to the Hao Kiet refugees, media coverage of the Betty Cuthbert event, and the press brief of Ms Cuthbert's support team. Click on the thumbnails to open a large size photo in a new browser window. Presented by Mr Roel Loopers, on behalf of Project SafeCom, to the Betty Cuthbert meeting with the Hao Kiet Refugees who have been released from detention. "Not so long ago, Australia assisted tens of thousands of Vietnamese refugees who knocked on our doors, asking for help with shelter and protection and help with rebuilding their shattered lives." "These tens of thousands of refugees from that time are now helping to build our Australia. They, together with their children and now grandchildren, are proud to be Australians, together with us." "At the time that those many Vietnamese arrived, we had a prime minister who travelled the country, not once, but twice. He travelled together with his immigration minister through Australia, and they talked to us in town halls, RSL Clubs, church halls and on the corners of the streets, asking for our help." "That prime minister asked us just for one thing. He told us that we could do this, he asked us to help him with the refugees, and he told us that we should do it, and he asked us to help with that job." "And we did. We listened to him. And the refugees came. That prime minister was a Liberal prime minister, and his name was Malcolm Fraser." "Now, 14 months ago, a small number of Vietnamese arrived again at our shores - just like all the forebears of white people arrived at Australian shores to seek a new life - but this time we dumped them on an island which is Australia - but which is at the same time NOT REALLY Australia." "They were relieved to finally arrive from their long and difficult journey, but they had NOT REALLY arrived in Australia, because our government had taken a knife and cut the island off from Australia - just to stop refugees. The current prime minister created a special, and in Project SafeCom's eyes, an extremely cruel hoax: a law that says that you're in Australia, but you're not in the REAL Australia." "The Hao Kiet refugees have friends from their home country living in Australia. They have family members living in Australia. But we, with millions of square miles to spare, deny them entry - and we drag our feet so cruelly about our decisions to let them in. It has now taken us 14 months to come clean on that determination, and the process of that determination is grossly unfair." "Project SafeCom wishes to express its ongoing fury and anger with the international scandal Australia represents in what we do to refugees, a scandal written about in justabout every newspaper in the world, but denied by a government that seems very sick in its mind." At Project SafeCom we have shown ourselves to be relentless in exposing the spin and untruths about the government's treatment of refugees. We congratulate the Hao Kiet Refugees with their impeccable and excellent advocate, Ms Betty Cuthbert. And we wish that all of you were with us in the real Australia as we know it, and we look forward to that day. In the meantime, we are committed to change our beautiful country Australia until it again becomes a country where refugees are welcomed. We have that commitment, because Australia was built by refugees, and it was built by boatpeople. Australian Olympic legend Betty Cuthbert has called for the release of more than 40 Vietnamese asylum seekers who have been in detention on Christmas Island for more than a year. The asylum seekers arrived on a vessel which was intercepted by Australian authorities off Western Australia's north-west coast. There are 43 asylum seekers remaining in detention on Christmas Island, while nine have been released on temporary protection visas. Two men from the vessel have been jailed for people smuggling. Betty Cuthbert today met the nine people who have been released and she says those who remain on Christmas Island need help. "I hope they will be released because they're so genuine," she said. "For them to do and suffer how they've done, to come here and to leave their own county and everything else...they know what they've left and they want to come to a better country." Betty Cuthbert has made a Plea for Prerogative of Mercy to the Prime Minister John Howard and to Minister for Justice and Customs, Christopher Ellison, to exercise and extend mercy and grant pardon to Mr Hoa Nguyen and Mr Tol Tran who have been convicted and sentenced under section 232A of the Migration Act in the Perth District Court. Although Tol and Hoa are charged under Section 232A of the Migration Act, they are not smugglers. They did not recklessly bring people into Australia for profit. They came instead as refugees, seeking asylum. Smugglers have a defined meaning in the International People Smuggling Protocol of which Australia is a signatory. 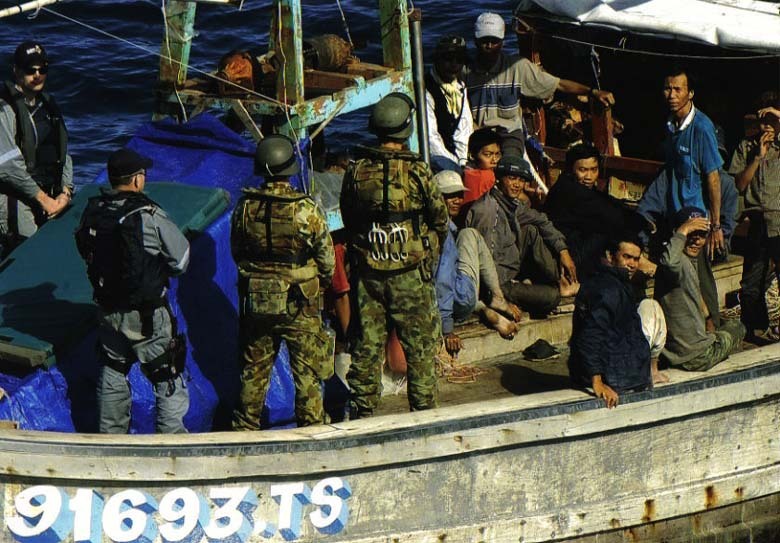 On 1 July 2003 the Australian Navy intercepted the fishing boat, the Hao Kiet, less than two kilometres off the Port Hedland coast and inside the Australian Migration Zone. The boat was carrying 53 Vietnamese relatives and friends of Australian citizen Hao Nguyen. The passengers and crew of the Hao Kiet were rudely, and probably illegally, taken out of 'Australian waters' ­ the Australian migration zone - and transported to Christmas Island 1,800 kilometres away. Tol Tran, the skipper, was tried under section 232A of the Migration Act 1958 (Cth) and found guilty of facilitating the bringing to Australia of a group of 5 or more people, reckless as to whether they had the legal right to come to Australia. He has yet to appeal. Tol Tran is unhappy and depressed because he is being held in prison with little hope of a satisfactory end. He fears that in the end, he will be deported and have to face the Vietnamese authorities and experience either life long incarceration or execution. Betty Cuthbert , Australia's Olympic Champion Gold running medallist, has made a passionate formal plea to the Prime Minister of Australia, on behalf of the Hao Kiet Refugees. Betty said that she was given opportunities by God in her life to run for victory for Australia and it would be a victory for Australia if we could help the Hao Kiet people who have had to 'run for their lives' from Vietnam. In a letter she signed today Betty Cuthbert has asked the Prime Minister take action for pardons and grant protection visa's to the Hao Kiet Refugees who have been imprisoned and detained since July 2003 after travelling by boat to Port Hedland. and can show good cause for their presence in Australia. The Hao Kiet was the first boat to reach Australia post Tampa and sailed into a political storm. 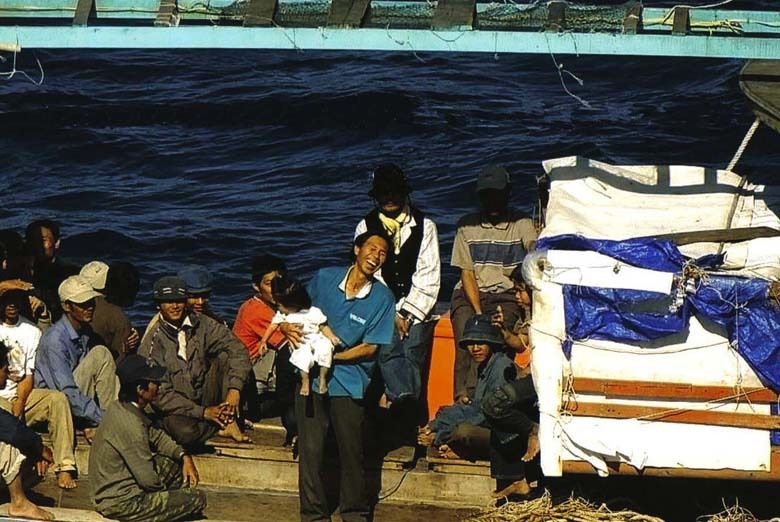 The Hao Kiet refugees were transported to Christmas Island. A senior lecturer in law at the University of NSW, Dr Mary Crock, said at the time of the transportation aboard the HMAS Canberra that the Government's motivation was purely political . "It will cost a fortune to get there, and it's completely unnecessary. Where you process is not going to deter anybody. It will just cost the taxpayers." Two men from the Hao Kiet were convicted and received mandatory sentences for People Smuggling offences despite the fact that the Crown agrees that Mr Tran and Mr Nguyen did not benefit in any way. "The Protocol requires States Parties to criminalize certain forms of conduct that is transnational in nature when committed intentionally and in order to obtain a financial or other material benefit." People smuggling is far removed from the conduct of Mr Tran and Mr Nguyen who at great cost to themselves saved many lives. Currently Mr Nguyen and Mr Tran are languishing needlessly in Western Australian prisons. Mr Nguyen is an Australian Citizen. Mr Tran is a Vietnamese National and could be subject to deportation at the completion of his prison sentence. Mr Tran says that he will face "certain death" if Australia hands him to the Vietnamese Communist authorities. Champion Olympic runner, Betty Cuthbert has asked for the prerogative of mercy to be applied in this matter because these two men are heroes and not people smugglers. Federal Australian Labor Member of Parliament, Mr Graham Edwards , a victim of the Vietnam War, who lost both his legs in a minefield explosion fighting the Communists, is poised to visit Mr Tran and Mr Nguyen in prison. Nine Ho Kiet Refugees have been released by the Australian Government from Christmas Island Detention on Temporary Protection Visas (TPV's) and are living Perth and Melbourne. The hearing date for Federal Court  Refugee appeals for the remaining 45 Refugees still in detention is not yet set, but may be during September or October 2004. 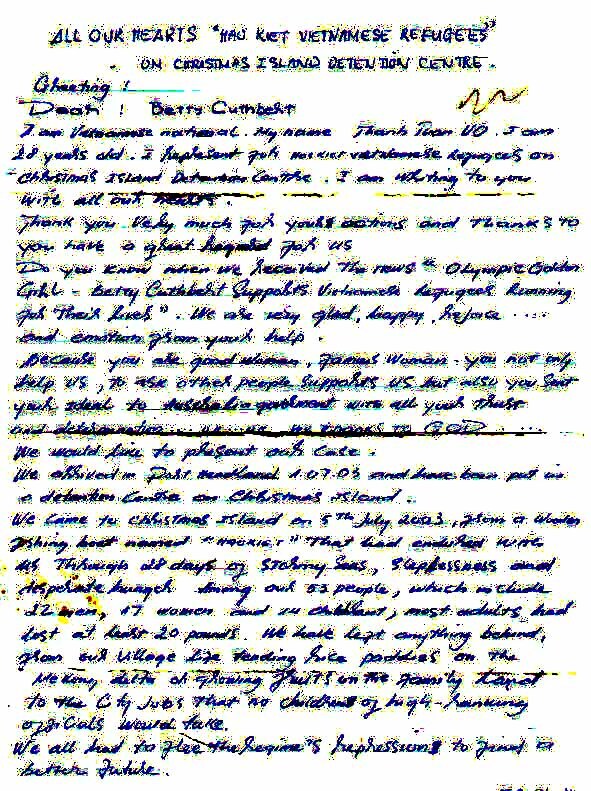 If the Golden Girl Betty Cuthbert's pleas are granted it could lead to Australia potentially saving millions of dollars through the cost of imprisonment and detention at Christmas Island. Mr Nguyen's sister Diem Nguyen, her son Vu Phan (19), a daughter Lan Phan (17) plus 2 nephews Vinh Tran and Chi Dinh (both 17) have been released on TPV's. Their emergency to flee Vietnam was urgent and a 15-year-old daughter of Mrs Diem Nguyen was left behind. Her heart is damaged by the decisions she was forced to make at the time. Immigration Minister Vanstone is able to exercise Ministerial discretion and grant these people protection visas because of their exceptional circumstances: they fall within her guidelines. Betty Cuthbert has asked for the Minister to take action expeditiously on humanitarian grounds and for "freedom to run from immediate fear of persecution" in Vietnam. These refugees are due protection by Australia as they face definite persecution in Vietnam because of their political opinions and beliefs. If Mr Howard wants the trust of Australia he needs to back up his words with action so that the Hao Kiet Refugees can stay and contribute like boatpeople from Vietnam have already done. Adelia Bernard, a retired official of the Catholic Office of Emergency Relief, has applauded Betty Cuthbert's support for the protection of the Hao Kiet Refugees. Mrs Bernard said, "I have seen the cruel handiwork of the Vietnamese Communists first-hand during my 30 years experience in South East Asia and I know the Hao Kiet Refugees have a real and present fear". She added, "the criminalizing of Mr Nguyen and Mr Tran is inhumane and we need to ensure that Australia protects and supports these courageous men". '$4m spent on boat trip could have been $100' By Tom Allard, Sydney Morning Herald, July 5 2003. "Surviving a Difficult Prosecution - A People Smuggling Trial, The Queen v Nguyen, Tran and another Perth District Court 2004" July 2004, AACP Annual Conference. Note: DIMIA has agreed to fund an appeal against the Department of Foreign Affairs' refusal to release documents relating to the Hao Kiet people, on which the RRT's refusal to grant protection to the remaining 45 people was based. PM Praises Refugee Success' Phillip Hudson August 29 2004, The Age. Click on the thumbnails to open the larger images in a new browser window. I am Vietnamese national. My name: Thanh Tuan VO. I am 28 years old. I represent for the Hao Kiet Vietnamese Refugees on Christmas Island Detention Centre. I am writing to you with all our hearts. Thank you very much for your actions and thanks to you have a great regard for us. Do you know when we received the news "Olympic Golden Girl - Betty Cuthbert Supports Vietnamese Refugees Running for Their Lives" we are very glad, happy, rejoice ... and emotions from your help. Because you are very good women, famous women, you not only help us, to ask other people support us but also you sent your ideal to Australian Government with all your trust and determination ... we thanks to GOD ... we would like to present our case. We arrived in Port Headland 01.07.03 and have been put in a detention centre on Christmas Island. We came to Christmas Island on 5th July 2003 from a wooden fishing boat named "Hao Kiet" that had endured with us through 28 days of stormy seas, sleeplessness and desperate hunger. Among our 53 people, which include 22 men, 17 women and 14 children, most adults had lost 28 pounds. We have left anything behind from our village life tending rice paddies on the Me Kong delta or growing fruits on the family land to the city jobs that no children of high-ranking officials would take. We all had to flee the regime to find a better future. During the past 15 months we have been in detention centre with feeling: worry, sad, fear ... and in our extremely difficult situation. 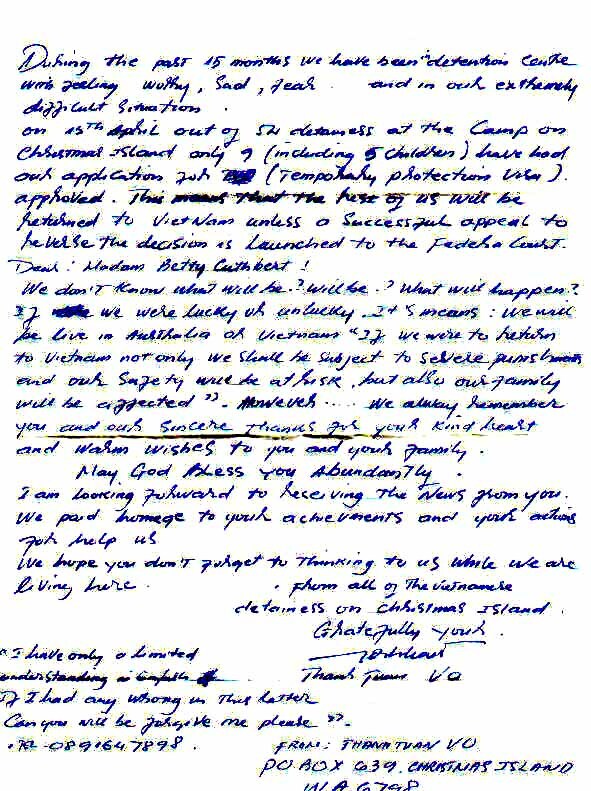 On 15th April out of the detainees at the camp on Christmas Island only 9 (including 5 children) have had our application for (Temporary Protection Visa) approved. This means that the rest of us will be returned to Vietnam unless a successful appeal to reverse the decision is launched to the Federal Court. Dear Madam Betty Cuthbert we don't know what will be? will be? What will happen? If we were lucky or unlucky. It means: we will be live in Australia or Vietnam. "If we were to return to Vietnam not only we shall be subject to severe punishment and our safety will be at risk, but also our family will be affected". However we alway remember you and our sincere thanks for your kind heart and warm wishes to you and your family. I am looking forward to receiving the news from you. We paid homage to your achievements and your actions for help us. We hope you don't forget to thinking to us while we are living here. Can you please forgive me please?